How Do You Like Them Melons? 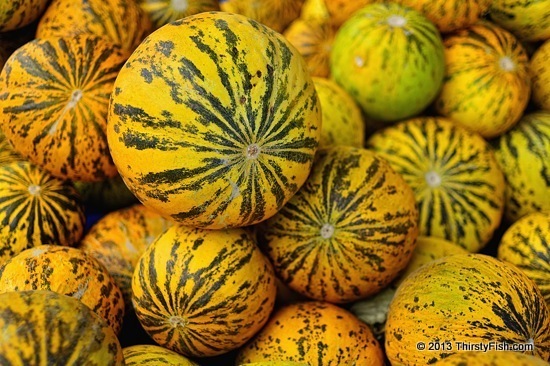 There are numerous varieties of melons. The pictured is the Dalaman variety. Tasty! GMO "research and development" is targeting numerous species of fruits, vegetables and grains, including melons. The days of shopping for "natural" foods at local bazaars - like the one in Urla where this photo was taken - are coming to an end. "Natural foods" are being fast replaced by Genetically Modified Foods, readily available at supermarkets. Some say: "So What?" More than 60 countries have banned the use of GMOs due to unacceptable risks to human health and the environment. But corporations like Monsanto are not sitting idle; They are pressuring nations to allow the growing of GMO crops. In the United States, over 80% of our food contains GMOs. But you would not know it, since big business has successfully kept GMO labeling off shelves.